@Victor , you close by saying, "I like this particular style well enough, but I like the more heavily peated and more heavily brined whiskies more." Are you talking about other whiskies in general, or other Springbanks? Either way, what are some of the more heavily brined whiskies you prefer? I've been chasing briny whiskies since my first taste of Campbeltown in 2010, but they're hard to find. 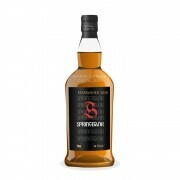 It seems like my "saltiness receptors" (or whatever) have blown out by heavily peated whisky, maybe, and I don't taste that straight brininess—without being part of a peat explosion—so much in whiskies where I used to find it, like Springbank 10 for example. @Ol_Jas I'm sure @Victor will get back to you when he wakes, with more examples. But I just noticed he chose Tobermory for his background image of this review. Have you explored that distillery (or Ledaig of course) and did your receptors fire...? @Ol_Jas, I was intending to differentiate the typical Springbank 'house style' from that of the 'house styles' of other distilleries, in particular Ardbeg, Laphroaig, Lagavulin, and Kilchoman. All things considered, from the same distillery, I would more often prefer to drink the better Longrows than most Springbanks. I have had some fabulous Springbanks, too, of course. I do think that a person can to some degree desensitise himself to some tastes. Whether that desensitisation is physical, merely psychological, or a combination of the two, I am not at all sure. You have clearly been on record as a brine hound from the beginning. I am sympathetic to that style myself. If the peat in a briny whisky is absent or light, though, I am a little more partial to the distillate of the Pulteney Distillary than I am to the distillate of Springbank. Just a little, though. Springbank is OK, and can be truly great. @vanPelt, as far as "when he wakes", yes, I went to bed before midnight last night at my sister's house, where we had a tasting for 9 persons. With respect to my choice of a review background image, I was just looking for some salt water to suggest the brine. @Victor Haha, I couldn't have predicted extra sleep after a tasting, I just meant you're diligent with replies and I knew you'd have another few hours so I didn't want to wait. Also @Ol_Jas in case I wasn't clear: I meant to recommend Tobermory as a distillery on the brinier side (but not necessarily peaty side). The background image is fitting. @vanPelt & @Victor , thanks for the extra comments. I've tried Tobermory a time or two and had mixed results, but maybe I'll give it another spin at the pub. I won't buy a bottle without a solid taste first. And I've got some Ledaig in my stash that's just waiting for its moment in the briny spotlight. One of these days. @Ol_Jas, Ledaig is quite a Forrest Gumpian trip: 'Ledaig is like a box of chocolates. You never know what you're going to get.' You'll probably like that about it, though. Its variations and vicissitudes pretty much all seem to be funky.